Rigatoni alla Norcina, a foretaste of heaven! Click HERE to request more details & 2019 registration form. Walk the streets of the early Christian martyrs. Pray over the tombs of Saints Peter and Paul. Celebrate Mass in the Catacombs. Learn about the many saints, martyrs and Popes of Rome right in the places where they lived, prayed and died. Discover the rich Biblical and spiritual themes in the Sistine Chapel, Vatican Museums and many other churches and pieces of sacred art in Rome. 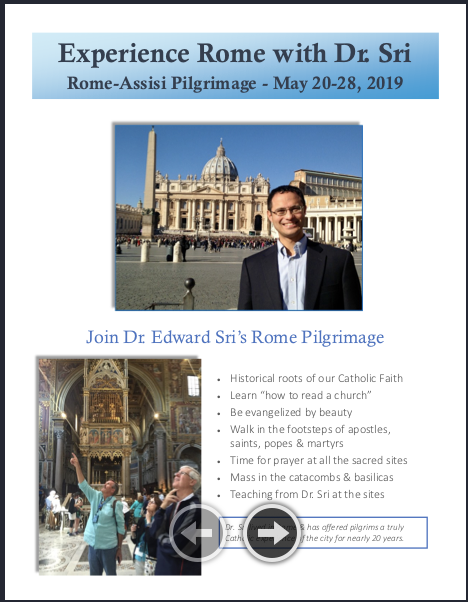 Dr. Edward Sri lived and studied in Rome and offers pilgrims a unique insider’s perspective on the Eternal City. With him personally guiding you through each site, the saints, churches and works of art will come alive powerfully and help you enter deeper into spiritual treasures of Christian Rome. Travel in a Smaller Group: Experience More! Many trips to Rome take place in large groups that are moved around in tour buses. But we travel in a small group, enabling us to walk the beautiful streets of Rome, enter more deeply into prayer and visit many more sites not on the typical tourist itinerary. Personal guided tours by Dr. Sri through each site make the churches, saints and art come alive for our faith today. Pray at the tombs of the martyrs & saints who shaped our Catholic faith. Click HERE to request more info for 2019 Trip. Plus a free day to explore Rome/Italy on your own!